Are two beautiful apartments which are part of the oldest Villa. Its façade is embellished with terraces and large masonry arched. 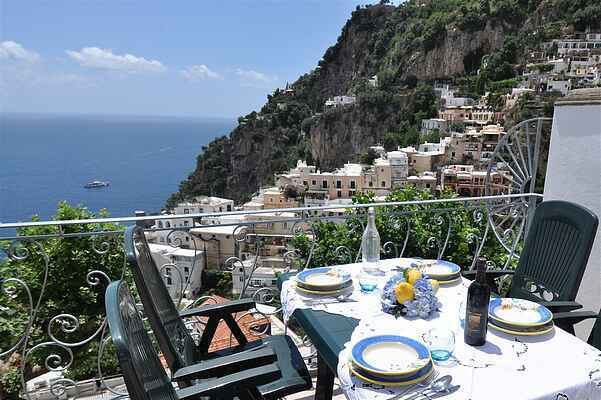 In our Villa you will be in the heart of that picturesque area of Positano, houses built on a steep rocky coast facing the sun and sea which renders the panorama of Positano so famous and unmistakable! You will be halfway between the beach and the entry in Positano, making it possible to reach either one either on foot that by bus. The house you reach it by climbing a 18-steps stairway from main road. You can reach shops nearby and the local shuttle stop on foot 30 meters. You can parking your car 100 meters (about 328 feet) away from the house in a pay parking lot. Details for Maristella 6 Bedrooms, Sleeps 12, 6 Bathrooms At first floor an indoor door will lead you from living room to the bedroom, inside to the bedroom, you will find one bathroom with jacuzzi. an second door will lead you from living room to the bedroom where will find one bathroom with shower. At second floor an indoor door will lead you from living rooms to the bedrooms, where there are four bedrooms. Inside to the bedrooms, you will find four bathrooms with a shower. Cette propriété ne peut être réservé en ligne. Cependant, vous pouvez envoyer une demande de réservation au propriétaire, avec les dates qui vous intéressent.